If you are planning a Thanksgiving Party this year, then try baking "Thanksgiving Cupcakes" for your guests. Cupcakes are a great choice for parties because they are easy and fun to make. 1) Preheat the oven to 350 degrees. Prepare two muffin tins with liners. Set aside. 2) In an electric mixer or a hand mixer, beat the butter & sugar together, till light and fluffy ,this may take 5 minutes. 3) Add the eggs to the butter one at a time, making sure each egg is incorporated well before you add each one. 4) Once all the eggs are incorporated add the vanilla essence and beat. 5) In a separate bowl whisk together the flour, baking powder, and salt. 6) 6.Add the dry ingredients in 3 parts, alternating with the milk and vanilla ,beginning and ending with the flour. With each addition, beat until the ingredients are incorporated but do not over beat. 7) Using a rubber spatula, scrape down the batter in the bowl to make sure the ingredients are well blended. 8) Carefully spoon the batter into the cupcake liners, filling them about 3/4 full and bake for about 18-20 minutes or until set and a toothpick inserted into a cupcake comes out clean. 9) Remove from oven and place on a wire rack to cool. Once the cupcakes have completely cooled, frost with icing. To make the frosting place the butter in a large mixing bowl. Add 1/2 the sugar and alternate adding milk/vanilla, remaining sugar and cocoa to taste while beating on medium speed until creamy. 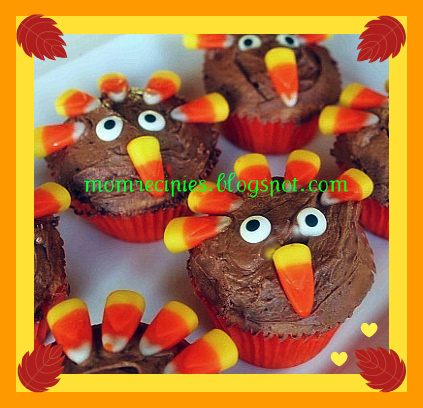 Frost the tops of the cupcakes and make a turkey using the Candy Eyes and the Candy Corns.